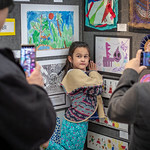 Hundreds of students - along with their proud parents and art teachers - gathered in the atrium of Capital Square last night for the opening reception of the annual DMPS Art Exhibit. More than 700 students from every school in the district had works on display. The exhibit runs through next Tuesday, April 16, so be sure to stop by for a look. Click here to see photos from the exhibit's opening.